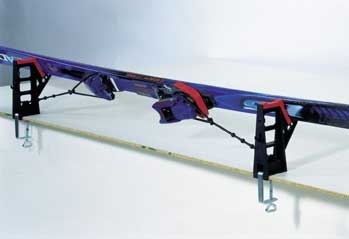 Low profile Profi ski vise using rubber ties to hold skis instead of the adjustable sole brake retainer. Includes Universal ski brake retainer. A good vise for home use. Works on all skis, is gentle yet firm. May be upgraded to high rise vise height with 3410 Profi spacer set and vertical clamp set MT3404.